How to effectively troubleshoot your VDI deployment Virtual desktop infrastructure has come a long way since the first steps were taken a decade ago to run desktop workloads in the data center. While more pervasive today, VDI technologies are latency-sensitive, and wholly dependent on the network. Complaints of poor end-user experience persist, especially over the WAN at branch offices where bandwidth constraints and latency delays are common. 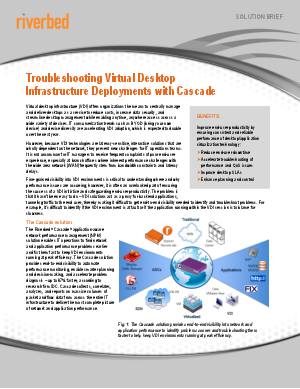 Read this brief to learn how the Riverbed® Cascade® application-aware network performance management (NPM) solution unlocks VDI visibility.